Hydrangea, Ajisai in Japanese, is one of the main feature of early summer. MustLoveJapan introduces the famous Ajisai spots and festival which you can enjoy great Ajisai flowers. June in Japan has lots of rain days, but Ajisai is so beautiful with rain. 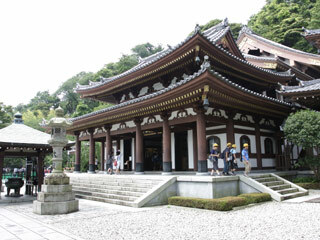 Especially, Kamakura has many temples which has great garden with Ajisai. Hase temple (長谷寺, hasedera) is also known as Hasekannon (長谷 観音), which is one of the Pure Land Buddhism Temples in Kamakura. The history of the temple starts at 736 when one of the Wooden Buddha statues drifted at Sagami beach. The current Buddha statue is 9.18m high which is one of the tallest Buddha stature in Japan. Hasedera enshrines also for Daikoku who is the seven lucky gods of Japan in Kamakura. The temple has great garden and Ajisai road, so when you visit this temple at June you can enjoy not only great temples, but also you can enjoy beautiful flowers. Entrance fee: 300 yen for adult, 100 yen for kinds. There are group discount for over 30 people. Open: 8:00 to 17:00 for summer, 8:00 to 16:30 for winter. Parking, tea house and gift shops are located.